Home NEWS Hope for late detainee Mukaru Ng'ang'a as family to finally receive compensation, 20 years after his death. Hope for late detainee Mukaru Ng'ang'a as family to finally receive compensation, 20 years after his death. Some members of the late Mukaru Ng'ang'a family outside the Milimani law courts, Nairobi. They include his wife Lucy Mukaru (in white and red), daughter Winnie Njoki Mukaru (left), grandson Marx Mukaru and Lucy's younger brother Francis Muthiora Kamau. 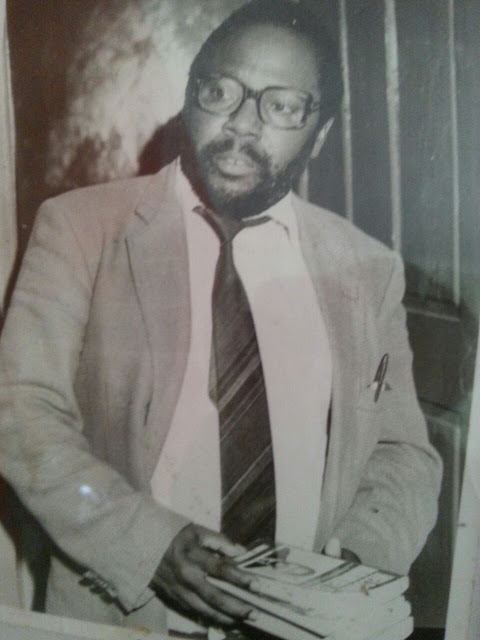 Twenty years after his death to date, the family of Kenyan former detainee, lecturer and multi-party crusader Mukaru Ng'ang'a is still pursuing justice. His kin have been fighting for compensation and an official government apology for the unlawful detention and torture of their beloved husband and father since his death in 1997. However, the family sighed with relief when hearing of his case finally kicked off at Nairobi’s Milimani law courts on July 25 this year. Mukaru, a former history lecturer at the University of Nairobi, filed a lawsuit in 1987 while still in detention. He was seeking justice over the tribulations he underwent during the Daniel Arap Moi regime but unfortunately he passed on before he got the opportunity to tell his story in court. The family has continued his fight as was his wish before he died and his wife Lucy Wanjiku Mukaru who took over the case after her husband’s demise, was the first to testify before Justice Chacha Mwita. Lucy gave an emotional account of how the family was traumatized by Mukaru’s frequent arrests and subsequent detention and torture. “He was first picked up from home in 1982 by a contingent of heavily armed security officers and for days we did not know where they had taken him,” said Lucy who now lives in Sweden with her children. The widow testified that the family later learnt through the media that Mukaru was detained without trial for sedition and when he was released in 1984, he recounted to her how he was subjected to torture and other injustices. “He was denied food and water for days and was forced to drink urine mixed with human excretion to survive. All this time he remained naked in a torture chamber with his feet immersed in cold water,” she told the court. As a result of his incarceration and the torture, Mukaru lost two teeth and could not walk without support, the witness said. His eye sight was also affected, she added. The witness said her husband was re-arrested in 1986 and held for 90 days before the detention orders were issued by the government, a move she termed as unlawful. She said in the next three years he was in detention, Mukaru was subjected to inhuman treatment including being beaten and starved. It was at this time that he filed a lawsuit against the government in 1987 while still detained. Lucy narrated in court that at one time her husband was approached by then Police Commissioner Philip Kilonzo who prevailed on him to drop his case against the state so as to win his freedom, but he declined. Mukaru’s first born son Oscar Ng’ang’a and the third born daughter Winnie Njoki also gave their testimony and recounted how their father’s tribulations traumatized his four young children. The two linked the death of their last born brother Rodney Kamau last year to post traumatic stress syndrome, a situation they said was caused by his witnessing the frequent arrests and harassment of their father by state agents while he was a young child. A statement presented in court by the eldest son says; “We must remember those Kenyans who were in prison and torture chambers because they dared say no to dictatorship, demanded a multi-party political system and basic human rights. Our father was a victim of the human rights abuses he was fighting for. “The victims and their families must be remembered if Kenya is to move forward and learn from the dark past, lest it happens again. We as a family are demanding justice as our late father can no longer stand in court and argues his case. A portrait of the Late detainee Mukaru Ng'ang'a. “We hope to be finally issued with a state apology for the death of a man whose only crime was to fight to ensure that the next generations of Kenyans were free to vote for whoever they wished to represent them,” Ng’ang’a said. Njoki who is a social worker based in Stockholm, Sweden, told court that she was only six years old when their father was first arrested and his detention affected her learning. She said that Mukaru and others who championed Kenya’s multi-party democracy and the country’s “second liberation” should be compensated and recognized as heroes for their sacrifices. The case was adjourned to October 17 this year when counsel will make their submissions. Mukaru’s family is represented by Nyamu Advocates while a Mr. Munene appears for the State. Mukaru’s case echoed the plight of other political detainees in the 1980’s and 1990’s which prompted global human rights body Amnesty International to intervene and appeal to the Kenyan government to investigate the matter. Several months after his release, on March 29th 1990 Mukaru fled from his Kiunyu home in Murang’a County after expressing fears to his wife that he was being followed around by strange persons whom he suspected to be plainclothes policemen. Later he escaped to Sweden where he sought asylum. This is where his family including his four children then aged between 12 and 20 years were also forced to flee. Since his death in 1997 the Mukaru family has been fighting for an apology for the torture and inhuman treatment of their husband and father which they believe led to his early death at the age of 52 years. The hearing has been cancelled or postponed numerous times without notice and this has meant members of the family who still reside in Europe have been forced to make round-the-world trips in pursuit of justice. Amnesty International repeatedly expressed concern for the safety and health of those held in administrative detention on an indefinite basis without trial because they criticized the government and ruling party and wanted a multi-party political system in Kenya. Reports published by Amnesty included torture complaints filed in 1987 by three prisoners of conscience, Mukaru being among them. Pressure was put on these prisoners by the state to withdraw the cases and when they refused, they continued to be held in detention long after others arrested with them had been released. Amnesty International stated that the conditions under which such political prisoners were held amounted to deliberate cruel, inhuman and degrading treatment. “They were made to wear prison uniform, which is often dirty and ragged, had no beds or mattresses, and medical treatment was often denied. The nutritional quality and quantity of their food, which their families are not allowed to supplement, is extremely poor,” read a report by the human rights agency. The organisation stated that administrative detainees such as Mukaru were rarely allowed access by relatives or legal representatives and were usually kept in permanent solitary confinement, without books or writing material while convicted prisoners are allowed a monthly family visit and reading material.